The three riders gather their thoughts at Hillary’s memorial tree. (l-r) Bill Werthmann, Sue Sohnle and Terry Fannon. Grief has been a part of Bill Werthmann’s life ever since his daughter, Hillary, took her own life ten years ago. Trying to come to terms with the loss, he looked for a purpose in her death, and about 2 and a half years ago he proposed the idea of taking her story across the country and hopefully reduce the stigma around mental health. He looked to inspirational Canadians Terry Fox and Rick Hansen, coupled with his boyhood dream of cycling across Canada, to hatch this plan. A plan that will be a significant personal physical challenge; a metaphor for the significant efforts needed to to destigmatise mental health. Bill is active in the Edmonton folk music scene, running the Northern Lights Folk Club. When he’s not cycling across Canada, he is the owner of SPECS Canada, a supplier of environmentally-sound cleaning supplies to the janitorial industry. Terry has been riding bikes for many years as a commuter and to run his dogs in the country. He has been a counsellor for many years, now working in the addictions field. Professionally he has met many adults who struggle with depression including risk of suicide and understands the challenges many Canadian adults and children have coping with down feelings. His hope is that the ride enhances awareness among Canadians that depression can be overcome and that help is available. Sue heard about the ride through her regular attendance at folk music shows. Having suffered from depression, it was a cause she instantly related to, and wished to help. She is an experienced bicycle tourist, having ridden tours in Canada, Europe and the USA. 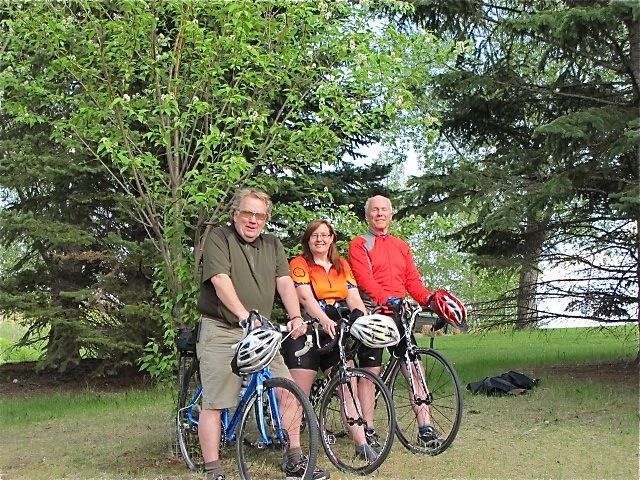 Al has been involved with Edmonton Bicycle and Touring Club, riding or volunteering in their signature ride, the Tour de l’Alberta, for years. Now retired, he was excited to be involved with the ride, not as a cyclist, but as the support driver, dish-washer, and updater of all things social media.